Rodents – In our effort to become a garden city, plants and greenery have been incorporated in the buildings and structures around Singapore. With all these plants around, they provide opportunities for other organisms to thrive. While many of these organisms such as birds and butterflies might be harmless or even beneficial to us, some might cause problems to humans. Rodents nest in burrows in soil where plants grow in. In our effort to bring greenery close to our living environment, rodents are also closing in to our lives. They pose public concerns as they are not only capable of transmitting diseases such as leptospirosis and rat bite fever but also causing structural damage when they chew on wires and other building structures. You have probably seen rodents running around residential areas or at the void deck of flats, or heard them squeaking in the middle of the night. This is due to the fact that rodents are commensal so they live in close association to humans and feed on whatever humans eat. You might have been feeding rodents without even knowing it. They scavenge for any food that you throw away so the rubbish bins and bin chutes might be their favorite haunt for nice, free food. How do we keep rodents away from bins and bin chutes. 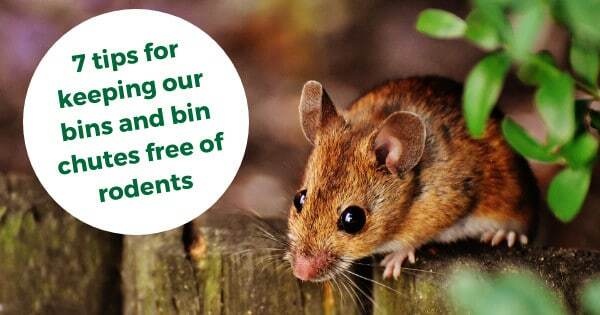 Rodents might perceive the placement of bins near to windows and doors as an invitation so you might want to make sure the bins are kept away from the entrances. Avoid exposing the bins to direct sunlight to help reduce the smell of food. Rodents are so flexible that they can squeeze through a space as thin as a pencil so it is important to make sure that the bins have been completely sealed. Furthermore, rodents are excellent climbers that are able to climb walls with rough surface. Be sure that the bin chute hoppers are closed tightly so that these unwelcomed guests are unable to gain access to upper floors. If bins are cracked or broken, have them replaced as the cracks serve as open doors for the rodents. Faulty bin chute hoppers should be repaired to make sure that they can always be closed tightly. Cleaning your bins regularly and rinsing them with disinfectant and hot water is a good way to get rid of smell that attracts rodents while removing any pathogens present around the bins. Killem offers bin chute flush out treatment to control the population of pests that are commonly found in bin chutes. By having clean bin chutes you can have your mind at peace as you will not have to constantly worry about pests sneaking into your house from these places. Kitchen bins with food waste attract rodents and other pests such as flies so it is important to empty them regularly. Throwing food waste into garbage bags or plastic bags will help isolating their smell while keeping the bins and bin chutes clean. Garbage should always be inside the bins and not be left exposed. Rodents are capable of biting through the garbage bags so make sure the garbage are always contained inside the bins. By giving a little bit of extra attention to the bins around us, we will be able to keep these unwelcomed guests at bay.